Today’s post is about a recipe fail.... But this is not a bad thing. In a small way it is somewhat akin to the way a “foster fail” in animal rescue circles isn’t a bad thing. Even though the result wasn’t the goal, ultimately the way things ended was very good. Today’s cake is everything a cake should be. It’s tender, beautiful to look at, pleasantly sweet… has a lovely, even grain…and is super delicious. One might wonder what could possibly be wrong with it. Well, the truth is, it isn’t the cake I intended to make. A few weeks ago a friend shared a slice of a delicious grapefruit cake with me. Around the same time I saw a grapefruit poppy seed cake on Instagram. These grapefruit cakes made me want to make my own grapefruit cake. So I decided to make one…with poppy seeds. As delicious as the first cake I tasted was, I wanted more of a pound cake texture (dense and finely grained). The image I saw on Instagram was more in the style of a pound cake, but it seemed to get its flavor boost from slices of grilled grapefruit shingled on top of the loaf —which didn’t bode well for storage purposes (and one of the things I like about pound cake is how well it stores). As I was thinking about the possibilities, I looked at a lot of recipes for pound cake-like poppy seed cakes. But ultimately I ended up drawing mostly from Ina Garten’s lemon cake, Rose Levy Beranbaum's lemon poppy seed pound cake and Helen Goh’s lemon poppy seed cake. With such fine recipes as my starting point, switching to grapefruit from lemon seemed like a fairly easy transition. And as I took my first run at the cake out of the oven, my hopes were high. The cake looked perfect: golden brown, gently domed, etc. It drank up the grapefruit syrup without any resistance. Sometimes cakes act like “I’m full…no more.…” And as you try to coax just a little more syrup in, it just runs off. But not this cake—all the syrup was easily absorbed. I made a beautiful pale, peachy pink (just the color of a pink grapefruit) glaze that fell in nice, thick random drips down the sides of the cake. It sliced beautifully—without tearing or producing a mess of crumbs—displaying a fine even crumb on the interior. Then. I tasted a slice. It was tender, sweet, moist and delicious. Unfortunately, it didn’t taste at all like grapefruit! It had juice, loads of zest, grapefruit syrup and a grapefruit frosting—but it only had a vague kind of general citrus flavor. I was mystified. 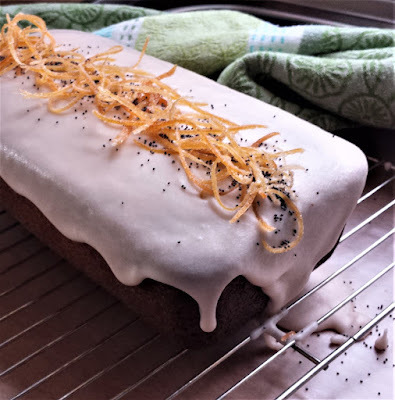 I gave out slices to friends—all of whom loved the cake (I had requests for the recipe) and all of whom agreed it didn’t taste of grapefruit. I tried three more versions of the cake. In the first I reduced a full cup of grapefruit juice down to two tablespoons before adding it to the batter. (A nice bonus of having to squeeze so much juice was extra zest that I candied and used as a garnish…) In the second I replaced all of the other liquid in the cake with straight grapefruit juice. Neither of these produced a more discernible grapefruit flavor. At this point, I decided to abandon grapefruit altogether and go with the blood orange that had been suggested by one of my first taste testers. You might wonder why I didn’t try varying some of the other ingredients—altering the amount of sugar…or the type of leavener…etc. I could have. And all of these things might have helped create the grapefruit taste I was looking for. But any of these changes would also necessarily change the texture and character of the cake. And since the texture and character of this cake was just about perfect, I wasn’t interested in pursuing any of those alterations. Instead, I have decided to rename the cake. 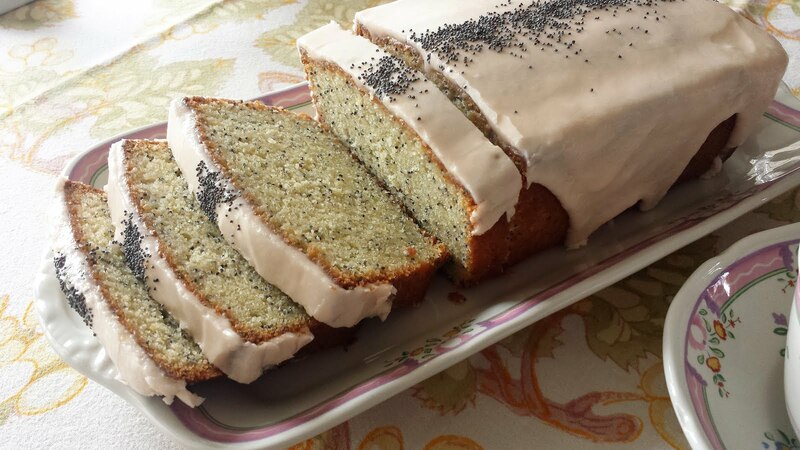 I no longer have a failed Grapefruit Poppy Seed Cake, I have a wonderfully successful Pink Citrus Poppy Seed Cake. It is delicious when made with grapefruit… Or blood orange. I imagine it would be excellent with Cara Cara oranges…or any juicy tangerine you might have on hand (there is a lovely new one out called a Ruby Tango that has great flavor and a beautiful rosy flesh). Lemons would be delicious too. Just think, if you made it with lemons and tinted the frosting pink, you would have a Pink Lemonade Poppy Seed cake. 2 T. grapefruit juice (28g)…or orange juice…or tangerine juice….etc. Preheat the oven to 350°F (see note). Butter and flour a 6-cup loaf pans. Combine the dry ingredients and set aside. Cream the butter, sugar and zest until light and very fluffy (about 5 minutes...possibly longer if the room is cool). Beat in the eggs and yolk, one at a time. Combine the yogurt and juice. Fold in the flour mixture in three additions, alternating with the yogurt mixture, beginning and ending with the flour mixture. Add the poppy seeds with the last addition of flour. Turn the batter into the prepared pan. Bake until golden and a cake tester comes out clean—about an 60 to 70 minutes. Combine 3 T. sugar with 3 T. juice in a small saucepan and cook over low heat until the sugar dissolves. When the cake is done, cool in the pan for 5 minutes; invert the cake onto a wire rack that has been lightly greased (pan spray works well for this). Brush the bottom of the cake with syrup. Set the cake upright and brush more syrup over the top and sides. Let cool completely. While the cake cools make the powdered sugar glaze (recipe below). Scrape the glaze onto the top of the cake and use an offset spatula to smooth the top and force the glaze to the edges where it should slip slowly and randomly down the sides of the cake. Garnish with a sprinkled “stripe” of poppy seeds down the center. When the frosting is "set", wrap the cake airtight. My 6-cup loaf pan is pyrex/glass, so I lower the oven temperature to 325° F when I make the cake. You can add 2 to 3 times this amount of zest. There is a lot more flavor in the zest than the juice and increasing the amount of zest is the best way to boost the citrus flavor. If you have time, combine the zest with the sugar ahead of time. The zest will infuse the sugar with citrus flavor and amplify the citrus taste of the cake. Note: If making a blood orange cake you will not need food color. Instead, cut juice to 1 or 2 t. and make up the remaining amount with milk. If you don’t cut the liquid with milk the frosting will be a dark pink instead of a pale pastel shade. I made this with blood orange and tangelo. Incredible!! Delicious recipe; thank you, Paige! What a lot of work you put into creating this beautiful cake, Paige! You are right, it is everything a cake should be! Even the color is very inviting. I will let you know how mine turns out. Erin, I'm so pleased that you like this cake! And I love your combination of Citrus! Bonnie, I can't wait to hear how your cake turns out!